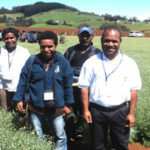 Four members of a small team that completed an ACIAR project to re-establish the pyrethrum industry in the PNG highlands were supported by the Crawford Fund to participate in a training course in Tasmania and Queensland around pyrethrum. They are also part of a small team of local PNG vegetable and pyrethrum research and extension officers who have worked very hard to develop the PNG pyrethrum industry with the support of Botanical Resources Australia. Neville Mendham, coordinator of the Crawford Fund’s Tasmania Committee explained that the work is ongoing, with the insecticidal extract being processed further in Tasmania. “Brian Chung has led BRA’s efforts towards the redevelopment of the pyrethrum industry in PNG,” explained Neville. “The crop complements the fresh vegetable industry in the same way as in Tasmania, where farmers have a perennial crop alongside the annual vegetable crops. In PNG the crops are mixed on the one piece of land, and all work is done by hand,” said Neville. The trainees also attended the International Pyrethrum Symposium held in Tasmania, and visited vegetable growers and research centres in Tasmania and Queensland. In a report on ABC Radio, it was noted that pyrethrum is a valuable crop for PNG Highland farmers, and that the partnership between Tasmanian researchers and companies and their PNG counterparts is helping pyrethrum make a comeback. “This trip has been a rare opportunity for me to gain a wealth of information that will be put towards developing a viable pyrethrum and vegetable industry in Enga province,” said Ms Manday Yaso, one of the trainees.